EXTRAORDINARY PROPERTIES UNIQUE STORIES SUCCESSFULLY REPRESENTED. Timeless, elegant, iconic property. Enjoy breathtaking ocean views from main living areas. Magnificent ocean-front pool and grounds. Described as “timeless and never to be dated” by its iconic architect Edward “Ted” Grenzbach of Beverly Hills, this incomparable estate encompasses a private 9.35-acre hilltop location. Grounds feature more than 4,000 SF of outdoor loggias. The main home reveals a commercial-grade kitchen, indoor/outdoor bar, gym and a wine-tasting room in addition to 5 fully appointed bedroom suites and garage parking for 14 cars. A 2-bedroom, 3-bath guest house and a 1-bedroom pool cabana are also featured. Coastal oasis on a lush .46 acre with 100 feet of ocean frontage. Enter the compound through a private gate with mature palms. The estate is situated privately away from the street. Enjoy ocean views from La Jolla to Dana Point. Master retreat is entire top floor, with floor-to-ceiling windows. Extremely private and a short walk to Moonlight Beach, shops and restaurants. Oceanfront! Over 5,000 SF of living space nestled on an approximately 12,000 SF bluff-top lot with access to the beach below. Situated on a quiet cul-de-sac amongst a series of high-caliber homes and in the heart of the South Laguna district. Contemporary styling brings a series of open layout levels with soaring two-story ceilings, tiers of living spaces, and all with stunning vantage points of the white water below. An updated kitchen provides solid-surface counters, generous island space and professional-grade appliances that include double Subzero refrigerators, Viking cooktop, double ovens and a separate two-burner cooktop. Oceanfront new construction masterpiece. Enjoy whitewater views of the California coastline from this custom-built and impeccably finished estate. Expansive open spaces, vaulted ceilings and wall-to-wall disappearing glass doors afford unparalleled ocean views. Entertain and dine al-fresco on the outdoor patio or unwind and fall asleep to the sound of the surf. Situated on a corner lot with no neighbor to the north and walking distance to the best restaurants and shops! Located in Southern California’s most exclusive enclave of Cameo Shores, this property embodies the community lifestyle at its fullest. Positioned in the second row, you are immediately taken aback by the expansive forever views of Catalina Island. The gourmet chef’s kitchen, marble floors, courtyard pool with cascading spa, and Roger’s Gardens landscaping are just a few of too many amenities to list. Walk directly out the backdoor to the beach with private entry below, or just lay back and listen to the waves crash. 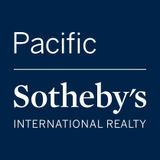 Contemporary single-story home overlooking the Pacific in Cameo Shores, a coveted neighborhood. The home showcases remarkable views from the master suite, and the spacious open-concept family/dining room that flows through to the chefâ&#x20AC;&#x2122;s kitchen makes it ideal for entertaining. The well-appointed property showcases three bedrooms in the main house, and a private guest suite with direct access to the courtyard pool and spa. The home beholds unique architectural details, custom built-in cabinetry, stacked stone walls, wood floors, a built-in BBQ, custom tile, and many more amenities. Watch the sunrise in the morning and set in the evening with unobstructed views of the ocean from your private deck. Minutes from world-class beaches and Carlsbad Village, Highland Manor is one of the most incredible homes, boasting spectacular panoramic ocean and lagoon views from all three levels of casually elegant charm. This estate was beautifully updated and landscaped, featuring five spacious bedrooms, four and a half baths and over 9,700 SF of impeccable living space. A breathtaking 2-story solarium with floor-to-ceiling windows leads to one of three expansive decks to capitalize on gorgeous views of Agua Hedionda and sunsets over the Pacific. Come down to the first level to enjoy a luxurious home theater with stage, wine tasting room and an enormous temperature-controlled wine cellar with a full pub in the game room. Endless ocean views, mesmerizing Catalina sunsets and romantic evening city lights draw you in. 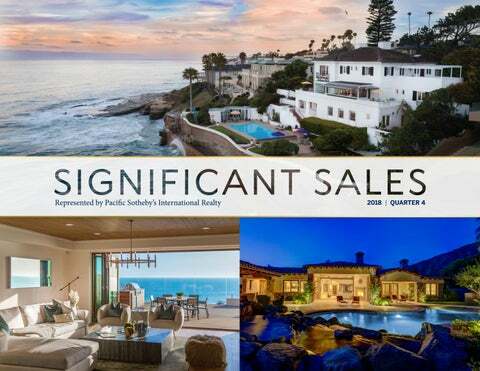 The towering, world famous beachfront mansion boasts the best location; with approx. 7500 SF, this 3-story, 6-bedroom all ensuite, light-filled Catalina-view mansion has infinite 180-degree views of coastline, islands and Long Beach skyline. Nearly every room has a white water view including the hydraulic elevator on all three levels. Homeâ&#x20AC;&#x2122;s many amenities include gourmet kitchen; private beach-view bubbling spa; master suite with office, dry sauna and vast 3-bay walk-in closet; 5-car garage, total 10car parking; entertainment room with 2nd kitchen plus dual guest powder rooms. This sprawling estate on the 3rd largest lot in the exclusive Bluffs of Huntington Beach brings the lush gardens and tranquil foliage of the English countryside to your own home. This stunning property boasts a welcoming floor plan on immense 30,000 SF grounds, showcasing over 6,600 SF of living space. The open-concept great room and kitchen is an epicurean masterpiece, bringing together a space to prepare gourmet dinners and host guests. This immaculate residence meets every buyerâ&#x20AC;&#x2122;s desire from inside out, including a brilliant master retreat and rooftop ocean views. As if woven from a romantic dream, this 15th-century French castle is tucked away on a beautiful hilltop at Cielo. While it may appear to have been transported from the past, it is very much a state-of-the-art 21st-century estate, with a computerized nerve center, Crestron smart home system and solar power. A moat with fixed drawbridge lends Old World ambiance outdoors. Approx. 12,000 SF, the estate features 4 bedrooms, 4 full baths, 7 half baths, a gated 500â&#x20AC;&#x2122; long driveway, 1,200 SF guest house, 11-car garage, elaborate pool, golf course, and a pool house with built-in BBQ and bathroom. Located on an approximately 9,600 SF corner lot just a few blocks from the beach. This 1930â&#x20AC;&#x2122;s beauty, built by Richard Requa, has been remodeled and updated, retaining the historical charm of its original architecture and awarded a Mills Act designation. With over 6,200 SF of living space, pool, roof deck and private rear yard, there is plenty of room for entertaining. The elevator takes you from the wine cellar to the roof deck to enjoy the San Diego skyline views and sunsets over Point Loma. The home has 6 bedrooms and 5.5 bathrooms. The ultimate beach house! This private, single-family residence has panoramic ocean views representing all that the seaside community of Mission Beach has to offer. Floor-to-ceiling retractable glass walls invite you into this 4-bedroom, 4.5-bath home. Full of luxury amenities including an enclosed jacuzzi and indoor/outdoor fireplace. An expansive master suite on the oceanfront features its own private balcony and a luxurious bathroom with a steam shower and spa tub. Each bedroom has its own bathroom and private ocean view. This classic Hamptons seaside influenced home is located in Bayshores, the premier private bay and beach-oriented community. Custom built new in 2014 with the finest of materials, features and amenities, no detail was compromised or overlooked in creating this exceptional home. Situated on a 4,000 SF lot parcel, this unique location faces east to west and offers westerly breezes and is within very close proximity to Bayshores Swim Beach and guest dock. Striking ocean views abound from both levels of this stunning, recently-renovated home and is within walking distance to pristine beaches and world-class shopping and dining at The Crystal Cove Promenade. Comprised of nearly 3,900 SF, large formal and informal social rooms, sun-drenched kitchen, 4-bedroom suites, including a second-level master suite, and spacious bonus room/media room with adjacent bathroom (optional bedroom 5). The home includes a private courtyard with built-in BBQ, rear lawn with covered terrace, spa with tranquil water feature and a 3-car garage. Residents of Crystal Cove enjoy 24/7 guard-gated and patrolled security, numerous parks, access to miles of hiking. The epitome of classic Spanish architecture, the historically designated home was designed by Richard Requa in 1927. This 5,336 SF 4BR property has been extensively remodeled while maintaining its historical integrity. Situated on a 20,010 SF lot with city and bay views the property features private grounds, an interior courtyard with fireplace, a dining porch off the kitchen, lush landscaping, plus a resort-style pool/spa and entertainment cabana. Perched at the top of Santaluz’s rolling hills, this new modern Mediterranean estate boasts breathtaking ocean and panoramic North County views. The amazing estate reveals a bright and spacious single level floor plan with impressive wooden beams accentuating the high ceilings of this inviting 5-bedroom and 5.5-bath home. The layout is inviting with a massive gourmet kitchen that opens onto the great room which is large yet intimate, opening onto the game room/bar and wine cellar. Jaw-dropping panoramic ocean views from this fully remodeled Sim Bruce Richards-designed oceanfront home. Open floorplan to maximize 3,400+ SF of indoor/ outdoor living featuring an outdoor kitchen and bar, hot tub, dry sauna, firepit and outdoor shower. Originally built in the early 1900’s, this home was recently renovated with impeccable finishes that savored the original charm, yet created a sophisticated and luxurious, modern-day beach home sensation. Live like you are on vacation every day or set the stage for someone else’s vacation and take advantage of the high-value income potential. Three bedrooms four bathrooms plus office featuring a light and open floor plan with floor-to-ceiling windows that bring the outside in. The home includes Italian porcelain, a marble fireplace, crystal ceiling fixtures, elevator, gourmet kitchen and Thermador appliances with marble quartzite counters and One Water whole-house filtration system. The third story includes a deck with built-in BBQ, 3-car garage with electric car station and boat dock for two 50â&#x20AC;&#x2122; yachts. Embracing epic coastline and panoramic ocean views, this brand-new rebuild of a mid-century classic enjoys all the aspects one should expect from a La Jolla home. New construction, great views, well-conceived living space, and a spacious 10,000 SF usable view lot with patio, pool, and play area. This easy floor plan functions extremely well as a single-level view home with effortless flow, and expands conveniently to the entertainment level complete with media room, kitchenette, and granny flat. This beautifully remodeled home by Emilio and Sons Construction is located on one of the most coveted streets. The superior finishes and timeless materials used to create the warm and wonderful ambiance are evident upon entry and consistent throughout the home. Equally as impressive is the lush landscaping, resort-like pool, spa and fountains. The kitchen is the envy of both amateur and gourmet cooks with state-of-the-art appliances and more than ample counter space. The master bedroom and bath enjoy a separate and private level with breathtaking ocean views. Truly one of Del Marâ&#x20AC;&#x2122;s hidden gems! Chic and modernized Spanish hacienda-style villa with breathtaking ocean and sunset views. The stylish designer dĂŠcor favors this pristine, recently renovated and modernized property. This beautifully integrated and architecturally refined single-level home has an abundance of natural light. Tree trimming revealed a most spectacular wide-angle view of La Jolla’s white water coast and beyond. 4,252 SF of floor-to-ceiling windows lets you see the LJ Shores with nobody able to see you inside the house perched on a four-acre lot of secluded, undeveloped greenbelt for max privacy and brilliant beauty. Stay healthy by using the workout room, steam sauna, swimming pool and 10’ x10’ spa. Party at the tiki bar and enjoy the fire pit with your friends while watching the sunset. Spanish revival-style home with classic Hollywood aesthetic in the west end of the Covenant fuses the best of Rancho Santa Fe with convenient location and the ultimate in indoor-outdoor living. This sprawling estate is an equestrianâ&#x20AC;&#x2122;s paradise with separate access to the horse facility and relaxed luxury in the main house. The guest house, service quarters, subterranean game room, pool, spa, and covered deck will inspire endless adventure and a unique style of living. This gorgeous custom estate with an Italian villa exterior and soft contemporary interior boasts panoramic ocean views all the way to Catalina Island and beyond. Located in Cielo, this home has one of the highest vantage points in San Diego County. Featuring five bedroom suites, library/office, game room, and two powder rooms in 7,629 SF, no detail has been overlooked. Spectacular ocean and sunset views from almost every room in the house, as well as from the vanishing-edge pool. Located on a quiet tree-lined street on the west side of the Covenant, this open and airy single-story Mediterranean enjoys natural light, garden patios and private canyon views. The floor plan includes a gourmet kitchen with butler’s pantry, six ensuite bedrooms in two separate wings, designated office, den, and four-car garage. Rich with warm details, this 8,000+ SF residence exudes a refined yet understated ambiance blending quality materials with timeless accents. Set on 2.49 acres with a detached guest casita and pool. Celebrate the end of each day with unobstructed and expansive views of colorful sunsets and the great Pacific Ocean. Impeccably maintained by long-term owners, this three-bedroom bluff-front home has an additional two bedroom apartment. Conveniently located just a few houses south of the “Stone Steps” with direct beach access, this home has a full three-car, plus one tandem, garage space for storing all the requisite beach gear, as well as ample parking in the drive. Further enhancing the value of this unique property is the permitted sea wall with full documentation. Brand-new coastal masterpiece one block to the beach. Innovative design with effortless indoor/outdoor living spaces, floor-to-ceiling windows, great room, master bedroom retreat, large landscaped yard, roof-top deck with 360 views of the downtown skyline, bridge, the Hotel Del and ocean. Phenomenal use of finishes including hand-rubbed white oak floors, white quartzite counters, porcelain siding, surround sound and solar panels. By local architect Dorothy Howard, built by Lorton Mitchell Custom Homes. 3 bedrooms, 3.5 bathrooms, 2,894 SF, 2-car garage, 6,371 SF lot and built in 2017. Situated in the prestigious, guard-gated community of Cielo, on a private 1+ acre lot, this modern and lightfilled Italian villa is a true architectural masterpiece. At an elevation of over 1,000 ft with southwest exposure, this estate offers panoramic ocean and city light views. Entertainerâ&#x20AC;&#x2122;s dream backyard complete with extraordinary vanishing-edge pool/spa, large masonry natural gas fire pit, outdoor kitchen and massive travertine-tiled observation deck on the second level. The ultimate luxury living awaits. Thereâ&#x20AC;&#x2122;s room for all in this Cape Cod-style home, with 5 bedrooms including one on the first level. The property includes 4 full and 2 half bathrooms, 3,476 SF, 7,500 SF lot a covered front porch, open living design, gourmet kitchen with granite counters and center island, dining room and family room with fireplace overlooking the pool with a spa and covered patio. Custom features include wood floors, high ceilings, large master suite with fireplace, 2-car garage, roof deck with city skyline and peek water views. A perfect beach house for full-time or seasonal living. Timeless Craftsman architecture meets coastal contemporary custom design. Set on the crest of a large flag lot offering both ocean views to the west and mountain views to the east. Experience total privacy on a lushly landscaped lot that is set back off the street, and a floor plan that takes full advantage of the natural light and view lines to the backyard. Bifolding doors open to covered patio. Built by DG Design to exacting standards and with the finest finishes and fixtures. Celebrate the art of coastal living in this beautifully upgraded, single-level home which offers the perfect blend of luxury and comfort in a breathtaking setting overlooking the Pacific Ocean, canyons and hills. Enjoy the best of indoor/outdoor living in the family room, dining room, and formal living rooms which all open out through double French doors to the amazing view patios. The wrap-around back yard has been delightfully finished with professional touches to perfectly compliment the panoramic views. This home offers a detached casita and the highest quality finishes throughout. Prime location, project house with incredible potential. Built in 1920, Mills Act-funded and historically designated with a property tax base of approximately $7,426 per year. Conceptual plans available and an option to redesign for your own needs on this 12,500 SF lot. Located across from the golf course and Glorietta Bay. This custom French country Bayshores home was built in 1990 by Robert McCarthy and is situated on one of the quietest blocks of this private gate-guarded community. It features optimal southern and western exposure for soothing sunlight and cool, coastal breezes. The property is steps away from two private bayfront beaches, two marinas, and exclusive access to the Balboa Bay Resort. Furnished by JB Nobel this 2-bedroom, 2-bathroom residence features a private direct-access elevator, 561 SF of outdoor living and forever views of Balboa Park, city and harbor. With architecture by DIALOG and interiors by Lorena Gaxiola, The Park homeowners have exclusive access to numerous on-site amenities including a magnificent negative-edge second-level swimming pool and terrace, outdoor lounge areas with barbeque and gas fire pits, a state-of-the-art fitness center with yoga studio and a wellappointed Ownersâ&#x20AC;&#x2122; Club room. This gorgeous, single-level home is located on a south facing 1/2-acre lot featuring indoor/outdoor living that represents the San Diego lifestyle. The home includes a great room and chefâ&#x20AC;&#x2122;s kitchen, a spacious covered patio with fireplace, formal dining room, two offices, exercise/ game room/home theater, 4+-car 1400 SF garage and attached 1-bedroom guest house, with full kitchen. The attention to detail includes a stereo system throughout, closed circuit TV, solar electric, radiant heated floors, air filtration system, salt water pool/spa and an environmentally sensitive low-maintenance yard. Enjoy picturesque views of the golf course from the spacious living room, with its oversized windows and doors leading out to a large patio, perfect for indoor/outdoor living, or relax in the nearby family room, with its beautiful stone fireplace and custom built-ins. Your inner chef will enjoy the oversized gourmet kitchen fully equipped with a large prep island, beautiful wood cabinetry, top-of-theline stainless steel appliances and office nook. Unwind in the master retreat, with a patio overlooking the golf course, and spa-inspired master bath, complete with a door leading to the backyard. Stunning 8,000 SF home with golf course views within the coveted Del Mar Country Club. Huge backyard with pool/ spa, fireplace and BBQ. Sumptuous master suite with large balcony overlooking the fairways, steam shower, separate dual closets and two commodes. All bedrooms are oversized and include an en-suite bathroom. The family room is large and open to the kitchen. Beautiful limestone fireplaces throughout. Media/game room on the first floor. Two offices â&#x20AC;&#x201D; one up and one downstairs. Privacy and grandeur emulate throughout. Incredible views of the canyon and distant ocean, city, and bay views. The property includes a custom pool and spa, an elevator, custom touches throughout and a 3-car garage. Cul-de-sac location. Live within art in this ultra-fabulous Meridian top-floor penthouse. Expansive and extraordinary, the blue water and city lights create a kaleidoscope of color and movement to behold. Sophistication, form, and design combined, with the luxury of open space describe this truly one-of-a-kind home. Unparalleled panoramic views greet you from every room and are enhanced by stunning architectural interiors, gorgeous woods, curved walls, raised ceilings, dramatic lighting, and an extraordinary exhibition kitchen. Mediterranean/Tuscan-design luxury home with a private courtyard entry, open concept living and back patio w/ built-in covered cooking station and resistance pool. Large formal dining room, great room with a fireplace, gourmet kitchen with a center island and butlersâ&#x20AC;&#x2122; pantry â&#x20AC;&#x201D; an entertainers delight. Well-appointed master retreat has a fireplace and french doors opening onto the patio. Attention to detail throughout with arched doorways, mural, suspended light fixtures, surround sound and so much more. Sit on your beachfront deck and marvel at the ever-changing colors of SoCal sunsets from this haven on the sand on a prime corner lot. A quiet seaside town, offering all the charm and preserved details of a quaint community surrounded by modern amenities, all within steps from this charming beachfront home. The spacious and open concept dollhouse boasts floor-toceiling panoramic windows with stunning views of the beach, Palos Verdes and Long Beach city lights from nearly every space in the house. The property has been remodeled from top to bottom with all new bathrooms, kitchen, flooring, paint, deck and A/C, boasting on-trend design in every space. Balboa Coves is the hidden neighborhood you never knew existed. This private, bay front community of single-family homes is security gated, with each property having its own dock. This home has a prime location with great afternoon sun and ocean breezes. It includes a dock, large patio on the water and main-floor bedroom. Access to Newport Bay, its channels and islands are only a short distance via a Duffy, power boat, or paddle board. Newportâ&#x20AC;&#x2122;s famous beaches are only a few blocks away. Situated on a premiere lot on Humboldt Island, this over 5,500 SF home showcases an incredible 80-foot yacht dock. Known for its architecture, design and intricate stained-glass windows, the exceptional property offers panoramic water views and 6 bedrooms, including an expansive master retreat overlooking the harbor. The main floor formal living room boasts a tranquil Koi fish pond and the massive chefâ&#x20AC;&#x2122;s kitchen features upgraded stainless appliances and granite, leading out to the airy sunroom. Savor sunsets on the deck while sitting poolside. Stunning single-level custom home, completely rebuilt with no expense spared. Gorgeous main house with executive office and home theater. Charming 1-bedroom, 1-bathroom guest house with full kitchen. 68â&#x20AC;&#x2122; pool/spa with waterfall, four fire features and more. Beyond the manned gates of Wildflower Estates awaits this exclusive 1.83-acre hilltop getaway complete with the pristine luxuries of a vanishing-edge pool, accompanying spa and surrounding lush landscaping. Nestled atop one of the best lots in Olivenhain, experience this 7,191 SF, 6-bedroom, 7.5-bath plus an office with a single-level guest house and an exercise room equipped with a steam shower. This home offers the ultimate in comfortable living and spectacular mountain, valley, and sunset views. This resort-like, country French estate features 23 acres of agriculturally zoned investment property with a gorgeous 5,800 SF home. The highly appointed home includes an imported stone entry, gourmet kitchen and pantry, wine cellar with tasting room, expansive view deck, two stunning pools, outdoor theater, jungle gym area and detached gym. Enjoy sweeping mountain views, serene gardens and workshop. This unique property is solar powered and has a generator system that can power the entire property. An extraordinary home located in one of the Coachella Valleyâ&#x20AC;&#x2122;s finest communities: Tradition golf club. This home has unmatched southern views of lush fairways and mountains, and genereous indoor and outdoor entertaining spaces. Comfortably large chefâ&#x20AC;&#x2122;s kitchen just off family room. Generous master suite. A detached casita has its own living room, bedroom and kitchenette and is just off the front courtyard. Building details include a total of five fireplaces, wet bar and a conversation pit and barbeque conveniently adjacent to the kitchen. Completely remodeled, contemporary, open floor plan, single-level home with ocean and night light views. Exquisite quality throughout with soaring ceilings, electric shades, three fireplaces, solar panels, solar shades and grass areas with room for pool. The kitchen and baths are of beautiful granite with all top appliances and fixtures. Beautiful drought resistant landscaping and lovely private walled front courtyard. The open floor plan with oak parquet floors and new look makes it inviting to all.